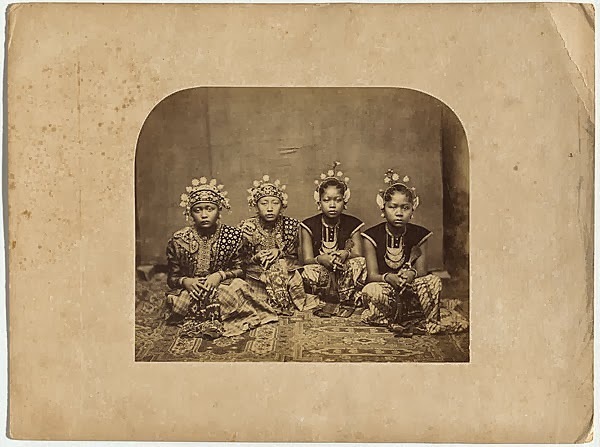 Court dancers, usually drawn from the ranks of royal families, were trained from childhood in the graceful and demanding movements of Javanese dance drama. One pair of girls in the Woodbury picture is wearing the traditional matching serimpi costumes. However, the Gallery's Senior Curator of Asian Art, Robyn Maxwell, has observed that the dancers are of different ethnic appearance and the check pattern costumes are south Sumatran in style. The models may be local girls wearing dance costumes.